The new DS-1 Automatic Day-Date keeps the modern person on a busy schedule precisely informed and in classy good company. Its sober timeless design—with a slightly retro influence—stands perfectly next to casual, business or formal attire. Faultlessly precise, its day-date feature adds an aesthetic touch to a model already well-known for its quality, reliability and elegance. The DS-1 Automatic Day-Date sports a broad and open face inside a classic, beautifully contoured 39 mm stainless-steel case with a transparent back, to let watch connoisseurs appreciate its finely-crafted movement. A gently rounded sapphire crystal with anti-reflection coating opens onto a black dial with nickelled indices and Superluminova-treated hands, which mark time against a finely graduated seconds scale. Additional Superluminova-enhanced marks divide this outer scale at 5-minute intervals, for clear reading under all lighting conditions. The Swiss-Made ETA 2834-2 automatic movement ensures impeccable timekeeping under the most demanding circumstances, thanks to CERTINA's famous DS Concept and its water-resistance up to a pressure of 10 bar (100m), confirmed by the evocative CERTINA logo on the tip of the crown of the DS-1. The new DS-1 stands apart thanks to its bold day-date indicators, along the vertical axis of a dial divided by elegant crosshairs. 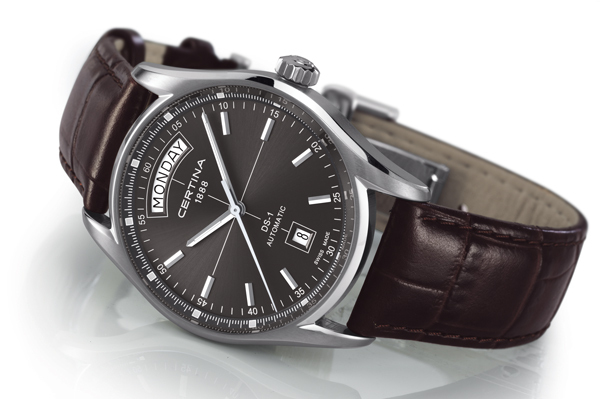 The name of the day is shown in a large semi-circular window above the CERTINA name, while the date window sits solidly placed at 6 o'clock, under the mention "DS-1 Automatic." The five-row stainless-steel bracelet with alternating brushed and polished surfaces completes the DS-1's harmonious design, while the folding safety buckle guarantees that your DS-1 stays safely with you at all times, and in all conditions. The DS-1 is also available with an anthracite, sunray-finished dial, nickelled indices and hands treated with Superluminova, in the same beautifully-contoured case, but with a brown leather strap and folding buckle with two push-buttons. 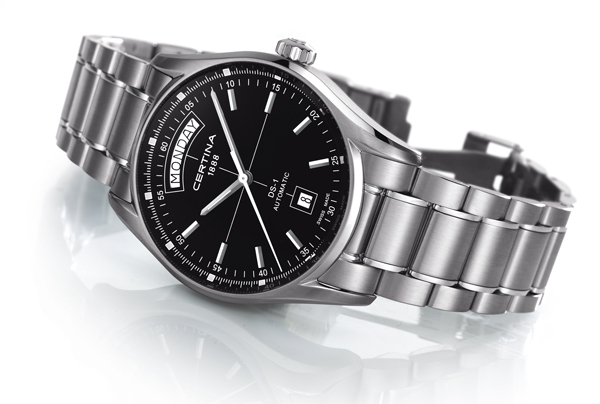 An additional version sports a silver, sunray-finished dial, and a five-row stainless-steel bracelet with a folding safety buckle. This classic model is sure to appeal to members of both genders, who appreciate a beautiful automatic timepiece with a slightly retro spirit, yet absolutely modern character.